As a little girl I imagined marrying a business man, much like my father. As a college student I was sure I’d marry a man doing full-time Christian ministry or a missionary. Instead, I married a mechanic. Even more to my surprise, my husband’s profession has become a part of my own identity, just as much as my own job has. Starting this shop has been a long journey. It’s hard to say when the journey actually started. Andrew’s been talking about doing this since before we began dating in 2011. At times the conversation was more serious than others. Then, last summer Andrew became really serious about making it happen. It had been such an up and down journey already that, to be completely honest, it took me some time to get on board. I’m now very glad we made this leap of faith and am very proud of my husband for what he is doing…especially after all the joys and trials we’ve experienced along the way. From finding the garage space to navigating through the government’s many requirements, every step seemed like the proverbial two steps forward, one step back. Throughout the whole process (and really anything I’ve ever known Andrew to do) my husband kept saying to me, “I just want to do the right thing.” The ‘right thing’ for Andrew refers not only to running an honest business. He wants to do the right thing for me, for his customers, and most importantly, before God. For me, I must admit that sometimes ‘the right thing’ can cause the selfish part of me to sigh and bite my tongue. I admire Andrew for not wanting to cut corners – to do everything right – but sometimes I just get a little impatient. I’m not the kind of person who enjoys the journey. I just want to get from point A to point B as quickly as possible. I try to joyfully make the sacrifices necessary to help my husband succeed – and sometimes I make them anyway, even when I am not joyful about it, because I not only love my husband but I also really believe in him. Now, I also find myself resisting temptations to get something done faster at the expense of doing it right. So, that’s where I fit into this whole journey. I come into the shop on my days off from being the Communications Coordinator for GHNI (a non-profit organization) to clean and organize the Marinelli Auto Service office. I do what I can to help market the shop. I write this blog – which has been fun but also a challenge (I’m learning a lot about automotive repair right alongside you!) – and I also pitch in here and there when Andrew needs an extra hand with diagnostics and repairs. I joke that I’m also training to be a mechanic – giving my husband an extra hand starting and cutting a vehicle’s engine, turning a steering wheel back and forth, or pumping the brakes as he flushes out the brake fluid. This is my life; one I never thought would exist. My dream is for Marinelli Auto Service to be successful…for people to bring in their vehicles and really feel cared for. I dream that one day I’ll be toting our kids along when I drop in to help Andrew and they will be just as proud of their father as I am of my husband, the mechanic. Update: This is the most popular blog post on the From the Mechanic’s Wife blog! Since it’s writing, I have come into the business full-time. I still clean, market, and pitch in when Andrew needs a hand, but I now also talk to customers, order parts, engage with other business and community members, do admin work and many other things to keep the shop running well and growing. 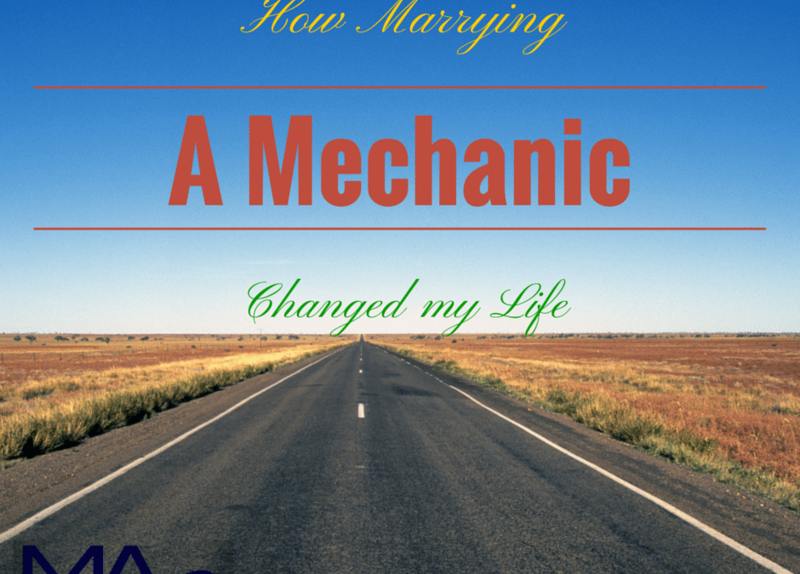 You can read a little more about what my life has become in my post, My Life As the Mechanic’s Wife.